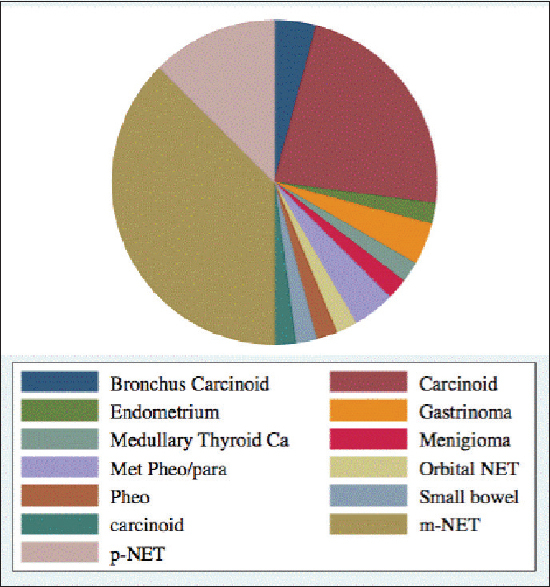 Neuroendocrine tumors (NETs) are a diverse group of tumors that often present late due to nonspecific symptoms. 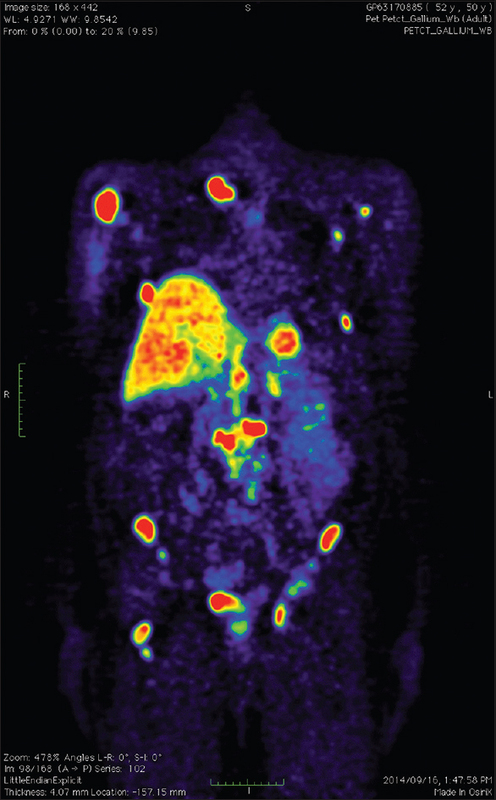 These tumors frequently express somatostatin receptors (SSRs), which allows for positron emission tomography/computed tomography (PET/CT) imaging with Ga-68-DOTATATE. In eligible patients, this may then be followed by peptide receptor radionuclide therapy (PRRT). Here, we report our initial results and experience with PRRT in a developing country, as one of the first groups to provide this therapy in South Africa. Eligible patients with confirmed inoperable NETs were recruited prospectively and treated with Lu-177-DOTATATE. 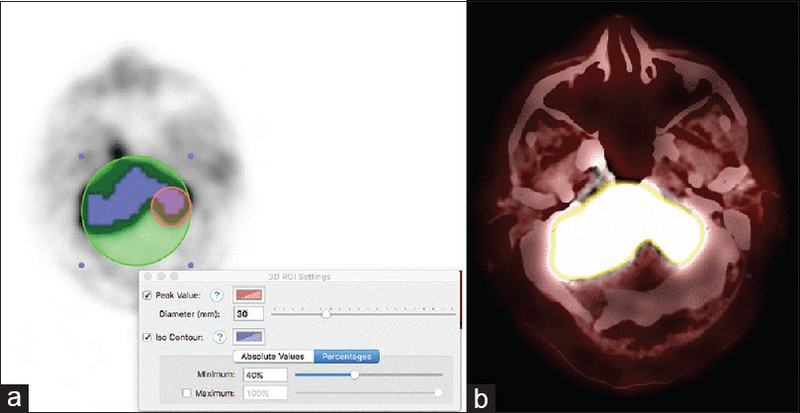 Baseline imaging was performed with either single-photon emission CT- or PET-based SSR analogs, whereas follow-up was performed with 68Ga-DOTATATE PET/CT 6 months post treatment completion. Interim treatment response evaluation was based on post therapy imaging of Lu-177-DOTATATE. A total of 48 patients with a mean age of 58 years were treated with PRRT, of whom 22 (46%) demonstrated stable disease, 20 (42%) demonstrated a partial response, and 6 (12%) demonstrated progressive disease. The median progression-free survival (PFS) was 20 months with an interquartile range (IQR)25%–75%of 4.5–30 months. The median freedom from progression duration was 32 months with an IQR25%–75%of 25–40 months, and the median overall survival was 10 months with an (IQR)25%–75%of 5–24 months. Our subgroup analysis demonstrated an inverse association between metabolic tumor volume with PFS, which requires further validation. In conclusion, PRRT with Lu-177-DOTATATE resulted in a median PFS of 20 months in patients with inoperable NETs in the absence of significant side effects. There are several patient and tumor-related factors that have been linked to disease outcome. These include the Ki-67 index, the plasma chromogranin A level, patient age, and prior therapies received. All these factors may impact on the success of PRRT. However, there has never been a report of this technique within an African setting where there are a number of key factors which may affect treatment. These include delayed access to appropriate health care and the presence of comorbidities. The aim of this review was to determine if the results of PRRT in an African setting match those reported from the rest of the world. This was an observational open-label Phase II trial investigating the use of PRRT in otherwise untreatable NETs. Patients included in this study consisted of those who were eligible for PRRT by having a biopsy-proven NET which was incurable by surgery alone. In addition patients were either considered inappropriate for chemotherapy or biological therapies and had at least completed two cycles of Lu-177-DOTATATE (LuTate). Only patients who provided informed consent were included in this study. Patients who underwent both baseline and follow-up evaluation with 68 Ga-DOTATATE (GaTate) PET/CT were included in a subgroup analysis to evaluate the possible use of quantitative measures. Baseline imaging consisted of any of the following:111 In-octreotide/99m Tc-Tektrotyd or 68 Ga-DOTATATE-PET/CT (depending on availability at referral center). PET imaging with 68 Ga-DOTATATE was performed 6 months post treatment completion to evaluate treatment response. 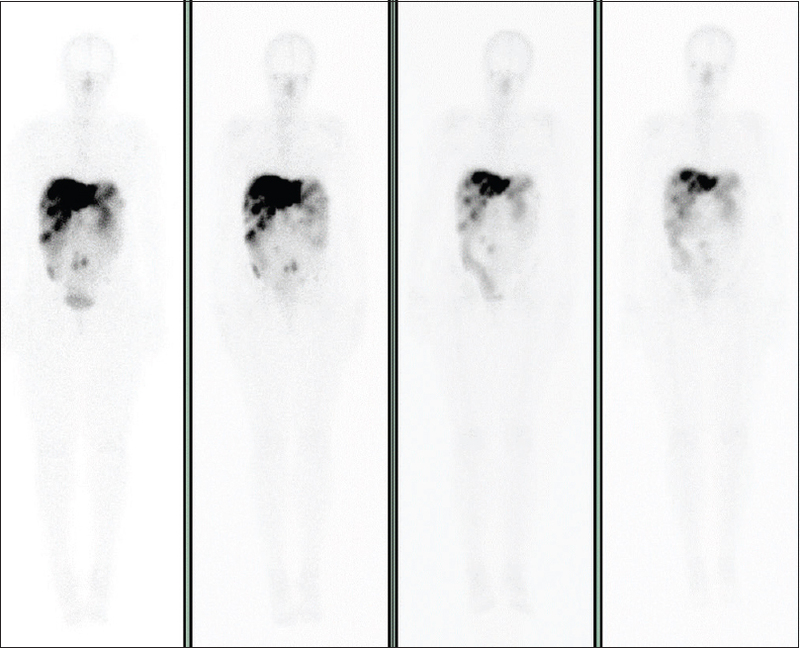 Interim treatment response evaluation was based on post therapy whole-body imaging (±single-photon emission computed tomography [SPECT]/CT) of Lu-177-DOTATATE. 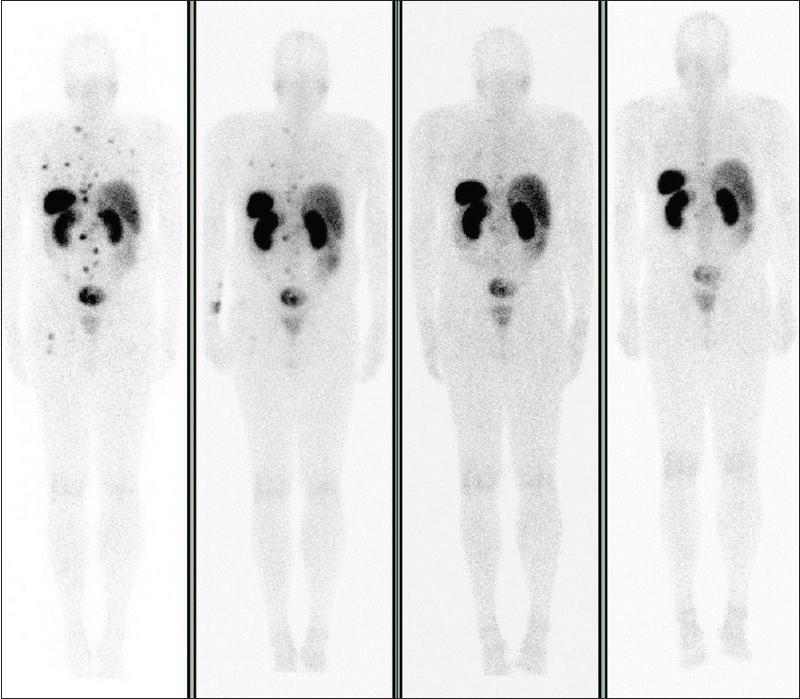 These images were acquired at 1, 4, and 24 h post therapy administration on a GE Hawkeye-1 SPECT/CT camera. Three nuclear medicine physicians evaluated the 24 h images of consecutive cycles to assess treatment response. Study participants were imaged on a Siemens Biograph 40 PET/CT scanner 60 min after intravenous (IV) administration of 68 Ga-DOTATATE. Both oral and IV contrast was administered, except where a contraindication such as inadequate kidney function or an allergy to iodine existed. Images were acquired in three-dimensional mode with a 4 min emission scan for each of, on average, 7–9-bed positions (matrix size 512 × 512) from the skull base to the pelvis. Reconstruction of images with and without CT-based attenuation correction was done using ordered subset expectation maximization to yield axial, sagittal, and coronal slices. For diagnostic CT, the following parameters were used: collimation of 24 mm × 1.2 mm, gantry rotation time of 500 ms, tube voltage of 120 kV, effective tube current of 100 mAs with online tube current modulation, and table speed of 18 mm/rotation. Contrast enhancement was achieved by IV administration of 100 mL of non-ionic contrast material (Ultravist; Bayer HealthCare Pharmaceuticals) at a rate of 2 mL/s. The metabolic tumor volume (MTV) was determined for the primary tumor and/or metastatic lesions with OsiriX MD using a three-dimensional sphere with a volume of 3 cm 3 and isocontour set at 40% of the maximum standard uptake value (SUVmax). Values were rounded off to the first decimal [Figure 1]. Progression-free survival (PFS) was calculated in months from the first cycle of therapy received until progression was noted on post therapy imaging or 68 Ga-DOTATATE PET/CT. 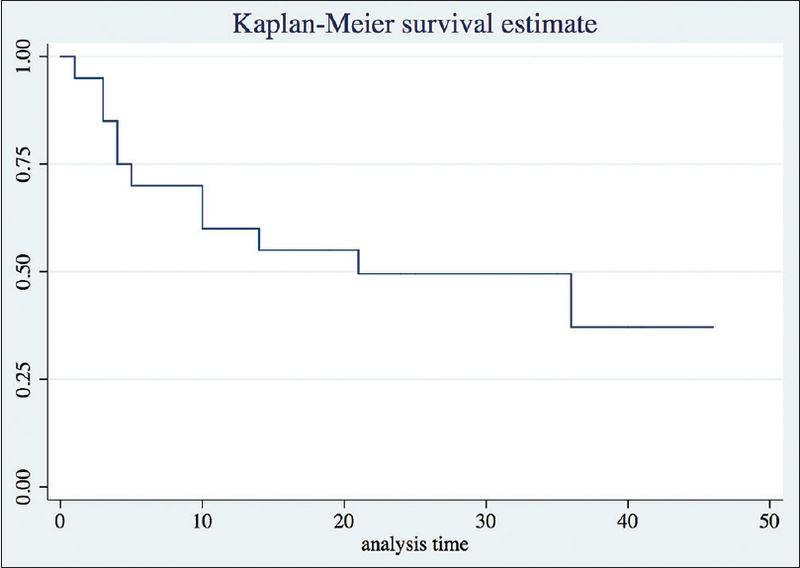 Overall survival (OS) was calculated for 15 patients from the date of first therapy to the date of their death (in months). Freedom from progression (FFP) was calculated in months from the date of first therapy for as long as the patient demonstrated a partial response or stable disease. Ondansetron (4–8 mg IV) and dexamethasone (4 mg IV) were administered as part of prophylaxis, and analgesics were prescribed and administered when needed. Patients were also provided with a diet tailored to the requirements of NET patients. Descriptive statistics were used to report on patient characteristics, imaging parameters, results of special investigations, and disease outcomes. Summary statistics are presented as mean (standard deviation) for parametric data distribution or as median (interquartile range [IQR]) for nonparametric data. Numbers or percentages are reported where appropriate. Regression analysis was performed to evaluate which of the following factors could be significantly associated with survival: age, chromogranin A level, Ki-67 (>10), tumor stage and grade, previous therapies, and their performance status (Eastern Cooperative Oncology Group [ECOG]). Statistical analysis was performed with STATA version 12.0 (Quantec), StataCorp 800-STATAPC (Lakeway, College Station, Texas, USA) and statistical significance was defined as P < 0.05. 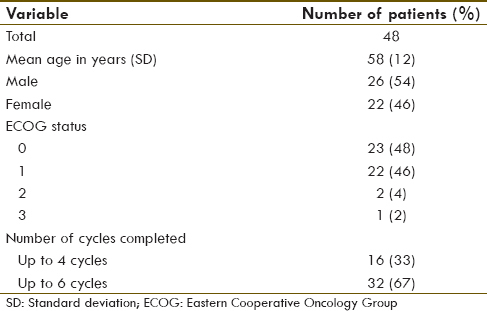 The patient population consisted of 26 males (54%) and 22 females (46%) with a mean age of 58 years (±12) and ECOG performance status of mostly 0 (48%) or 1 (46%), with 4% and 2% of patients, respectively, classified as ECOG 2 and 3. Patients tended to present at an advanced disease state with multiple sites of metastatic involvement [Figure 2] and [Table 1]. The majority (67%) of our patients received up to four cycles of PRRT over a median treatment duration of 8 months. The remaining patients (33%) received an additional two cycles of PRRT [Figure 3] and [Table 2]. 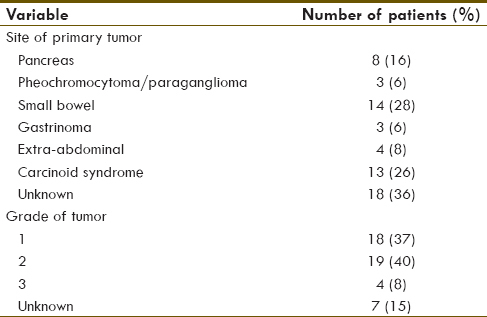 In most instances (28%), the primary tumor was located in the small bowel, followed by pancreatic NET (16%), whereas in 36%, the primary tumor could not be identified but was suspected to originate from the small bowel [Figure 4] and [Table 3]. Tumor grading varied mostly between Grades 1 (37%) and 2 (40%) with only 8% of patients treated with Grade 3 tumors. Chromogranin A levels ranged from 26 to 60,290 with a mean value of 3054.6 ± 9908.1. 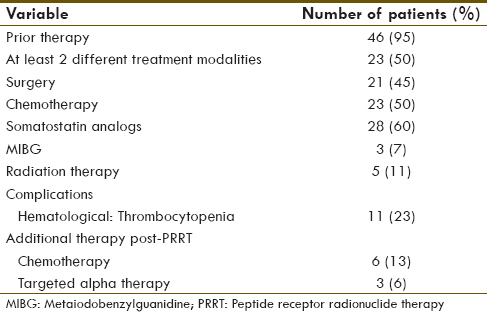 Forty-six of our patients (95%) had received therapy before PRRT, either in the form of chemotherapy (50%), therapy with long-acting somatostatin analogs, surgery, external radiation therapy, therapy with I-131-metaiodobenzylguanidine, or a combination of the aforementioned treatment modalities. Twenty-five patients (50%) received (and failed) at least two forms of therapy before their referral for PRRT [Table 1]. Regression analysis identified the patient's ECOG status as the only factor that was statistically significantly linked to disease outcome (P = 0.026). No significant permanent renal complications occurred in this group of patients, and bone marrow suppression was documented in 11 patients (23%), which most notably affected the platelet count. Grade IV toxicity was present in two patients who required transfusions. One of these patients was a diabetic with hypertension who was therefore predisposed to such complications [Table 2]. At the end of 4–6 cycles, 22 (46%) patients were classified as having stable disease, 20 (42%) patients demonstrated a partial response [Figure 5] and [Figure 6], and 6 (12%) demonstrated progressive disease. 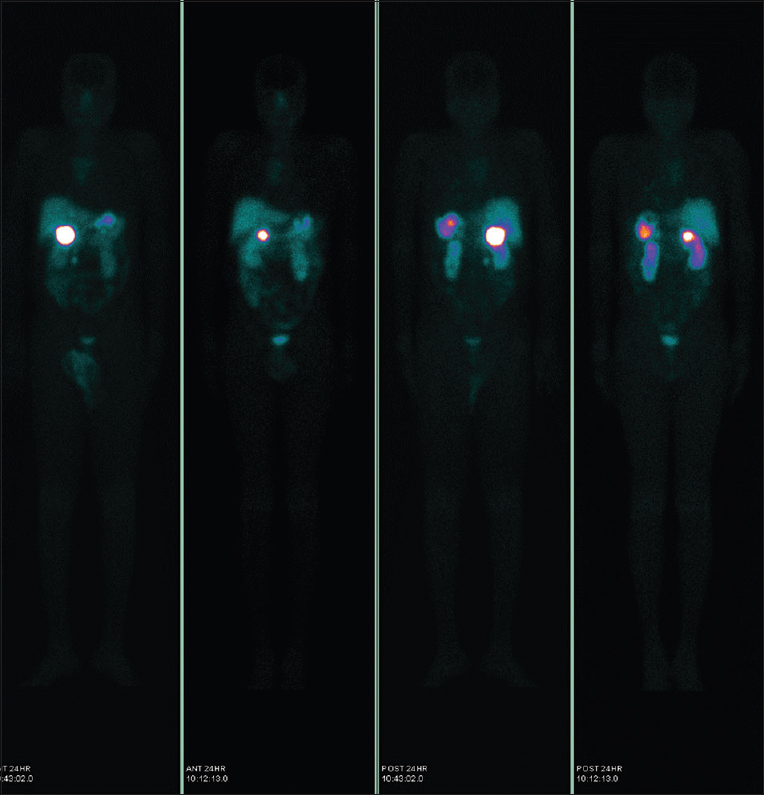 These patients were referred for chemotherapy after confirming the presence of de-differentiated disease of 18 F-fluorodeoxyglucose (18 F-FDG) PET/CT [Figure 7]. The median PFS was 20 months with an IQR25%–75% of 4.5–30 months [Figure 8]. The median FFP was 32 months with an IQR25%–75% of 25–40 months and the median OS was 10 months with an IQR25%–75% of 5–24 months. Over the treatment period of 51 months, the mortality rate was 15/48 (31%). The mean OS was 10 months [Figure 9] (range 1–28 months) and patients had a median age of 58 years. Our patients received a median of four cycles over an 8 months treatment duration and demonstrated the following tumor grades: Grade 0 (6%), Grade 1 (60%), Grade 2 (27%), and Grade 3 (7%). 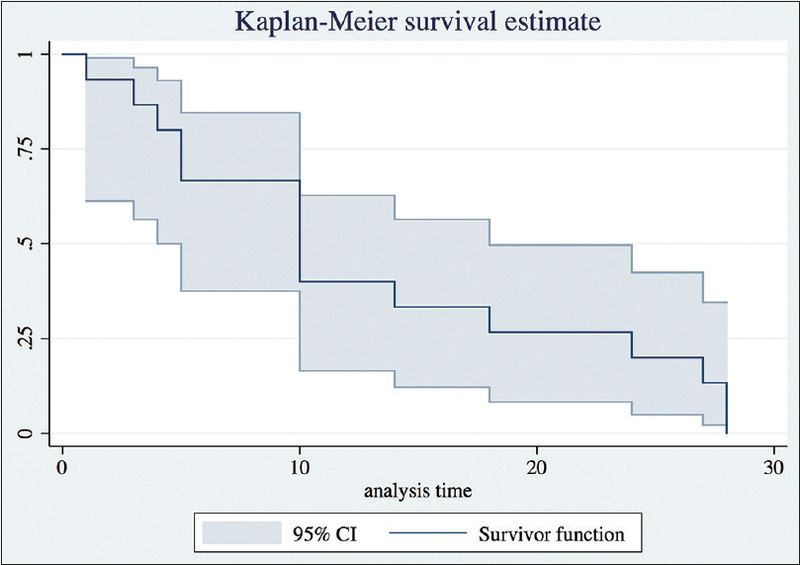 They were not significantly different from the group of patients with a longer survival although the authors acknowledge the limitations of such a small subgroup comparison. Eligible patients were those who had at least completed four cycles of PRRT, who and who had both a baseline and a follow-up Ga-68-DOTATATE PET/CT (n = 18). Patients included eight males and ten females with a median age of 58 years, which ranged from 29 to 74. The majority of patients had more than five sites of involvement upon presentation and had failed several other forms of therapy before PRRT. The mean PFS was 23.2 months (+/-11.57) and ranged from 4 to 45 months. MTV of the primary tumor resulted in a median value of 30.6 (1.9–85.1). 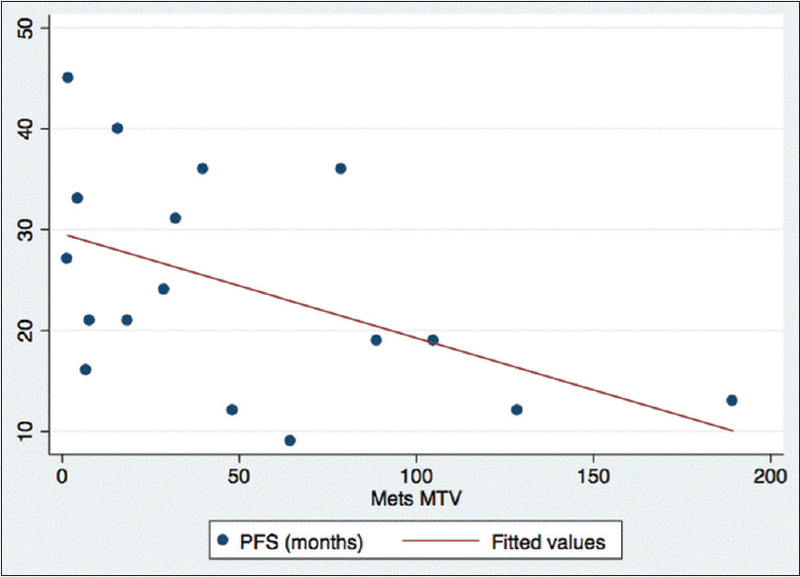 A two-way scatter plot demonstrated an association between lower MTV values and a higher PFS. Preliminary results suggest an inverse association between MTV with PFS, which requires further validation [Figure 8]. Numerous problems surround both the diagnosis and treatment of NETs and these are generally well documented. Some of the more important ones include the late-stage presentation of many of these patients, the accurate localization of the primary tumor, misleading or unreliable chromogranin A levels, and differences in tumor biology between the primary tumor and its metastatic deposits, resulting in obtained Ki-67 values that are not always representative of the entire disease burden. Tumor behavior can also change, leading to a loss of somatostatin receptor expression or de-differentiation. Patient factors that have been associated with the disease outcome following PRRT include patient age, primary tumor site, tumor histology and stage, the Ki-67 index, the Karnofsky performance status, the tumor burden (especially the liver burden), and the baseline neuron-specific enolase level. In our study, the patient's ECOG status was statistically significantly linked to survival, with a higher ECOG predisposing to a worse outcome. The roles of 68 Ga-DOTATATE PET/CT and 18 F-FDG PET/CT are complimentary in that imaging with 68 Ga-DOTATATE enables the accurate staging and treatment response evaluation of well-differentiated NETs, while imaging with 18 F-FDG enables the visualization of any areas of de-differentiated disease. Both of these imaging options, therefore, contribute significantly to directing therapy to the most appropriate form. The choice of imaging is generally based on the Ki-67; a lower value suggests better differentiation and therefor favors imaging with 68 Ga-DOTATATE compared to a higher value that suggests poorer differentiation and suitability of FDG-PET imaging [Figure 4].,, Conflicting reports exist regarding cutoff values, and ideally patients should be imaged with both modalities to accurately assess the most appropriate form of therapy. The associated costs, logistics, and radiation burden considerations unfortunately do not always allow for this, especially in a resource-poor setting. The addition of or decision to change to chemotherapy is usually considered in the presence of de-differentiated disease. Chemotherapeutic agents such as sunitinib and everolimus have been evaluated for the treatment of advanced well-differentiated NETs. The RADIANT-4 randomized controlled trial compared the efficacy and safety of everolimus to that of a placebo and reported an increase in PFS in the everolimus arm. Sunitinib appears to be another promising agent for use in this setting. The quantification possibilities offered by PET imaging are to date not optimally used and may potentially form an integral part of patient management with regard to treatment response evaluation, prognostication, dosimetry, and in the individualization of patient therapy plans. Semi-quantitative measures, which may overcome some of the subjectivity of qualitative evaluation, include SUVmax/mean/peak, MTV, total lesion glycolysis, and various tumors to background ratios. A study by Kim et al. on the prognostic value of volume-based metabolic parameters in twenty patients with p-NETs reported MTV as a significant independent prognostic factor on F-18-FDG PET/CT.,, Our preliminary results from our subgroup analysis similarly demonstrated an association between lower MTV values and a higher PFS [Figure 10]. Should imaging demonstrate localized disease that is amenable to surgery, this obviously remains the treatment modality of choice. Patients with metastatic or inoperable disease, who demonstrate significant tracer accumulation into the tumor and/or metastatic lesions (Krenning score of 2 and above), and who have adequate renal and bone marrow parameters, generally qualify for therapy with Lu-177-DOTATATE/TOC/NOC. Other treatment approaches include the use of Y-90-DOTATATE/TOC/NOC either alone or in combination. PRRT is generally well tolerated with relatively mild side effects reported. The most important PRRT-related side effects include nephrotoxicity and suppression of the bone marrow. In the largest study of its kind (807 patients), Bodei et al. reported severe nephrotoxicity in only 1.5% of patients and hematological toxicity Grades 1 or 2 in around 80% of patients. Severe hematotoxicity occurred in just under 10% of patients. The group also found that persistent toxicity was associated with a shorter duration of PRRT from the first to the last cycle and that nephrotoxicity was more likely to occur in patients treated with Y-90-based PRRT either alone or in combination with Lu-177-DOTATATE.,, We similarly found that the most important side effects were related to bone marrow suppression with the most pronounced effect noted on the platelet count. Further exciting developments include the use of targeted alpha therapy, with Bi-213-DOTATOC as has been first reported by the Heidelberg group. We have also treated a number of patients with Bi-213-DOTATATE with similarly promising results. Other novel possibilities include the use of various hybrid imaging modalities. The NETTER-1 trial is the first Phase III multicentric, stratified, open, randomized, controlled trial to evaluate PRRT in patients with inoperable, progressive, somatostatin receptor positive midgut NETs and compare it to a somatostatin analog. Their preliminary results (from 230 patients randomized to receive either PRRT 8-weekly or octreotide LAR 60 mg every 4-week) indicate a clinically meaningful and statistically significant increase in PFS for patients with advanced midgut NETs treated with PRRT when compared to octreotide. Again, our results are not at a significant variance from this result. In the South African setting (as previously mentioned), patients are frequently referred for PRRT at a very advanced stage of the disease and often as a last resort. At present, PRRT is not funded in the public health sector and as such only a small number of patients with medical aids are able to afford and receive therapy with LuTate. Even in these cases, not all of the medical aids are willing to reimburse the costs of these therapies considering that many of these patients have already exhausted their oncology funding at the time of referral to PRRT. The costs of long-acting somatostatin analogue therapy in South Africa rival that of one cycle of LuTate. PRRT with Lu-177-DOTATATE in our setting has led to a median PFS of 20 months in the absence of major side effects with patients generally reporting a high quality of life. There are significant costs involved in the management of patients with NETs. Funders should, however, consider the possible cost savings associated with offering and funding a theranostic approach that consists of a diagnostic GaTate PET/CT and therapeutic Lu-Tate at an earlier stage, rather than as a last resort. A cost-effectiveness study from the funders' perspective would be very interesting indeed. Limitations of this study include the heterogeneous group of patients in terms of primary tumor site, presence of carcinoid syndrome, and various stages of referral with various prior therapies received. Many of our patients were not imaged initially with 68 Ga-SSR PET, which limited the number of patients available for quantification evaluation and possible prediction of side effect occurrence. Due to the limited patient numbers, statistical analysis to determine which factors may possibly predict a poorer outcome could not be performed. Similarly, due to the patient numbers, it was not possible to compare whether there was a statistically significant difference in the occurrence of side effects between those patients who received four cycles of therapy compared to those who received more than four cycles. Our subgroup analysis demonstrated an inverse association between metabolic tumor volume with PFS, which requires further validation.PRRT with Lu-177-DOTATATE resulted in a median PFS of 20 months in patients with inoperable NETs in the absence of significant side effects. Modlin IM, Oberg K, Chung DC, Jensen RT, de Herder WW, Thakker RV, et al. Gastroenteropancreatic neuroendocrine tumours. Lancet Oncol 2008;9:61-72. Van Essen M, Krenning EP, De Jong M, Valkema R, Kwekkeboom DJ. Peptide receptor radionuclide therapy with radiolabelled somatostatin analogues in patients with somatostatin receptor positive tumours. Acta Oncol 2007;46:723-34. Treglia G, Castaldi P, Rindi G, Giordano A, Rufini V. Diagnostic performance of Gallium-68 somatostatin receptor PET and PET/CT in patients with thoracic and gastroenteropancreatic neuroendocrine tumours: A meta-analysis. Endocrine 2012;42:80-7. Baum RP, Kulkarni HR, Carreras C. Peptides and receptors in image-guided therapy: Theranostics for neuroendocrine neoplasms. Semin Nucl Med 2012;42:190-207. Bodei L, Mueller-Brand J, Baum RP, Pavel ME, Hörsch D, O'Dorisio MS, et al. The joint IAEA, EANM, and SNMMI practical guidance on peptide receptor radionuclide therapy (PRRT) in neuroendocrine tumours. Eur J Nucl Med Mol Imaging 2013;40:800-16. Sathekge M. Targeted radionuclide therapy. Contin Med Educ 2013;31:289-94. Ezziddin S, Attassi M, Yong-Hing CJ, Ahmadzadehfar H, Willinek W, Grünwald F, et al. Predictors of long-term outcome in patients with well-differentiated gastroenteropancreatic neuroendocrine tumors after peptide receptor radionuclide therapy with 177Lu-octreotate. J Nucl Med 2014;55:183-90. Werner RA, Bluemel C, Allen-Auerbach MS, Higuchi T, Herrmann K 68Gallium-and 90Yttrium-/ 177Lutetium: “theranostic twins” for diagnosis and treatment of NETs. Ann Nucl Med 2015;29:1-7. Basu S, Ostwal V, Ranade R, Panda D. Supportive measures and finer practice points in 177Lu-DOTATATE PRRT for NET: Aiming for optimal disease management. J Nucl Med 2014;55:1916-7. Oh S, Prasad V, Lee DS, Baum RP. 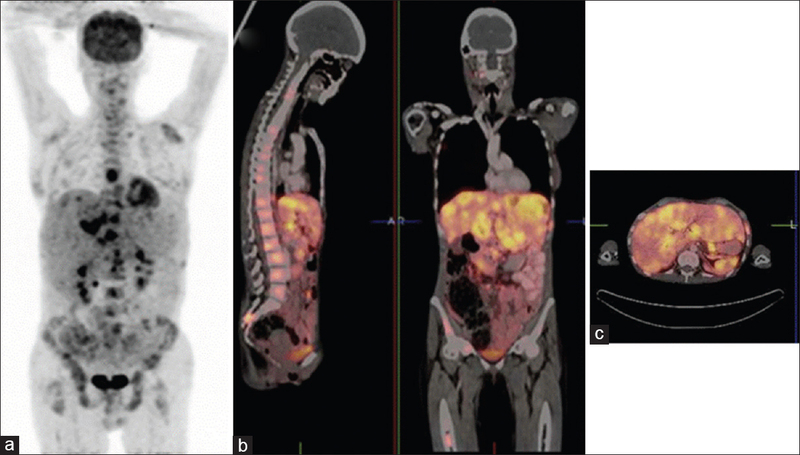 Effect of Peptide Receptor Radionuclide Therapy on Somatostatin Receptor Status and Glucose Metabolism in Neuroendocrine Tumors: Intraindividual Comparison of Ga-68 DOTANOC PET/CT and F-18 FDG PET/CT. Int J Mol Imaging 2011;2011:524130. Basu S, Sirohi B, Shrikhande SV. Dual tracer imaging approach in assessing tumor biology and heterogeneity in neuroendocrine tumors: Its correlation with tumor proliferation index and possible multifaceted implications for personalized clinical management decisions, with focus on PRRT. Eur J Nucl Med Mol Imaging 2014;41:1492-6. Campana D, Capurso G, Partelli S, Nori F, Panzuto F, Tamburrino D, et al. Radiolabelled somatostatin analogue treatment in gastroenteropancreatic neuroendocrine tumours: Factors associated with response and suggestions for therapeutic sequence. Eur J Nucl Med Mol Imaging 2013;40:1197-205. Pusceddu S, De Braud F, Lo Russo G, Concas L, Femia D, Vernieri C, et al. How do the results of the RADIANT trials impact on the management of NET patients? A systematic review of published studies. Oncotarget 2016;7:44841-7. Kim HS, Choi JY, Choi DW, Lim HY, Lee JH, Hong SP, et al. Prognostic value of volume-based metabolic parameters measured by (18)F-FDG PET/CT of pancreatic neuroendocrine tumors. Nucl Med Mol Imaging 2014;48:180-6. Houshmand S, Salavati A, Hess S, Werner TJ, Alavi A, Zaidi H. An update on novel quantitative techniques in the context of evolving whole-body PET imaging. PET Clin 2015;10:45-58. Frey EC, Humm JL, Ljungberg M. Accuracy and precision of radioactivity quantification in nuclear medicine images. Semin Nucl Med 2012;42:208-18. Hofman MS, Lau WF, Hicks RJ. Somatostatin receptor imaging with 68Ga DOTATATE PET/CT: Clinical utility, normal patterns, pearls, and pitfalls in interpretation. Radiographics 2015;35:500-16. Hofman MS, Kong G, Neels OC, Eu P, Hong E, Hicks RJ. High management impact of Ga-68 DOTATATE (GaTate) PET/CT for imaging neuroendocrine and other somatostatin expressing tumours. J Med Imaging Radiat Oncol 2012;56:40-7. Kwekkeboom DJ, de Herder WW, Kam BL, van Eijck CH, van Essen M, Kooij PP, et al. Treatment with the radiolabeled somatostatin analog [177 Lu-DOTA 0, Tyr3]octreotate: Toxicity, efficacy, and survival. J Clin Oncol 2008;26:2124-30. Bodei L, Kidd M, Paganelli G, Grana CM, Drozdov I, Cremonesi M, et al. Long-term tolerability of PRRT in 807 patients with neuroendocrine tumours: The value and limitations of clinical factors. Eur J Nucl Med Mol Imaging 2015;42:5-19. Kim SJ, Pak K, Koo PJ, Kwak JJ, Chang S. The efficacy of (177) Lu-labelled peptide receptor radionuclide therapy in patients with neuroendocrine tumours: A meta-analysis. Eur J Nucl Med Mol Imaging 2015;42:1964-70. Kratochwil C, Giesel FL, Bruchertseifer F, Mier W, Apostolidis C, Boll R, et al. 213Bi-DOTATOC receptor-targeted alpha-radionuclide therapy induces remission in neuroendocrine tumours refractory to beta radiation: A first-in-human experience. Eur J Nucl Med Mol Imaging 2014;41:2106-19. Bison SM, Konijnenberg MW, Melis M, Pool SE, Bernsen MR, Teunissen JJ, et al. Peptide receptor radionuclide therapy using radiolabeled somatostatin analogs: Focus on future developments. Clin Transl Imaging 2014;2:55-66. Toumpanakis C, Caplin ME. Update on the role of somatostatin analogs for the treatment of patients with gastroenteropancreatic neuroendocrine tumors. Semin Oncol 2013;40:56-68. NETTER-1 Phase III in Patients with midgut neuroendocrine tumors treated with 177Lu-DOTATATE: Efficacy and safety results. Clin Adv Hematol Oncol 2016;14 5 Suppl 7:8-9.